This page is mainly aimed at what is involved with servicing older audio equipment and some of the common issues and some of it does relate to modern electronics and audio as well. I’ll try and keep this as basic and simple as possible without going too ‘technical’…forgive me if I do in places…its how my brain is wired! What tends to go wrong with amplifiers and receivers as they age? Dirty controls/potentiometers and switches – The symptoms of this generally present themselves along the lines of one or both channels dropping in and out at random, weak or faint sounding audio on one or both channels, crackling/popping/fluttering or the likes and can make the amplifier sound rather awful and not very nice to use. One way to know this for sure is to rotate or push the function buttons/switches and if this aggravates the problem then they need cleaning for sure. And of course the more controls – the more likely hood of this problem, especially Sansui/Pioneer/Kenwood/JVC quadraphonic units – Switches galore! The best way to fix this is to have them all cleaned and lubricated using a special cleaning solvent by Caig Products called ‘De-Oxit’. I regard this cleaning solution as the best available today. 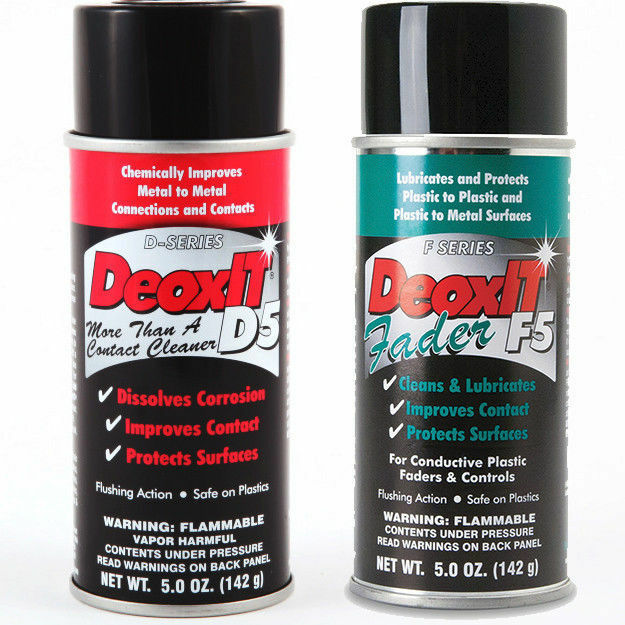 De-Oxit has a property that actually dissolves the tarnishing and corrosion off the internal switch contacts or carbon wiper/track and flushes it out at the same time. 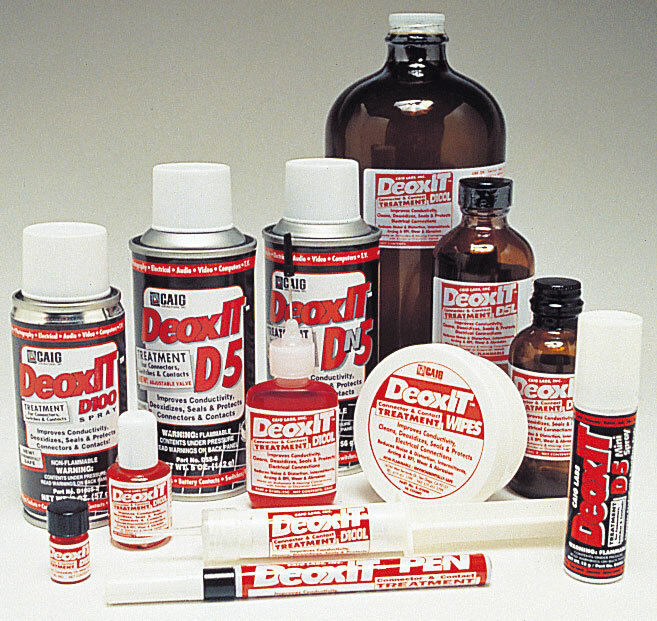 I use this in everything I repair and do maintenance on and it has proven to be a very good product. 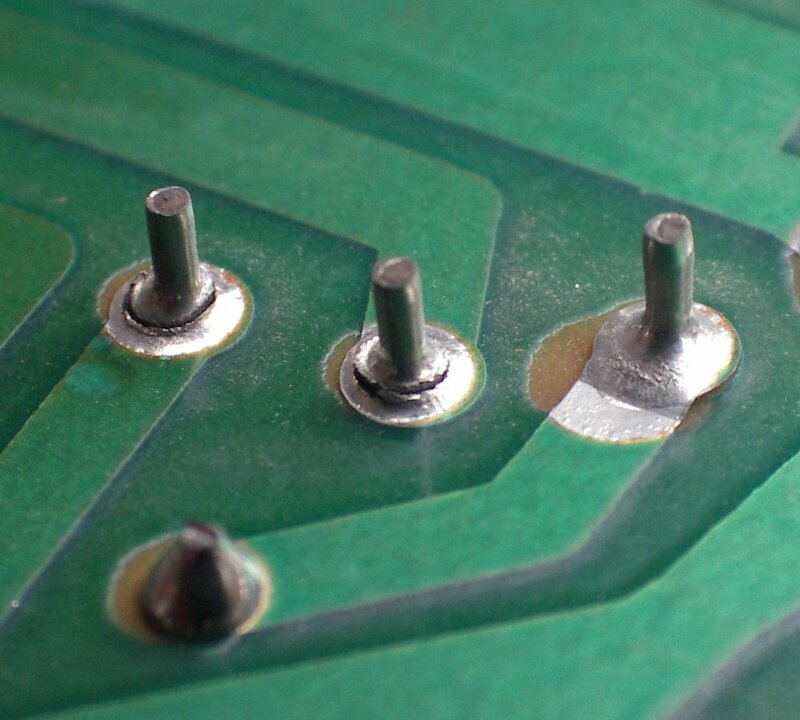 Dry solder joints – A very common problem with electronics across all fields. In audio gear this problem can present similar symptoms as the above but will also cause the unit not to work properly or sound right and can make it turn off/shut down when its warm or in some cases not even turn on at all. A dry solder joint is where the solder joint expands and contracts around a connection or component leg at a different rate especially where heat is concerned and when it cools down the solder actually cracks over a period of time and starts to separate from the copper track resulting in a poor connection. A nice fresh solder joint looks shiny and wet where as a bad solder joint looks dull, crusty and dry hence why it is called a ‘dry joint’. Also frequent moving of controls and using input sockets or pulling cables out regularly can cause the solder to crack due to fatigue and same thing happens. The best remedy for this to go over and re-solder all the bad joints with fresh solder and this generally fixes the problem. 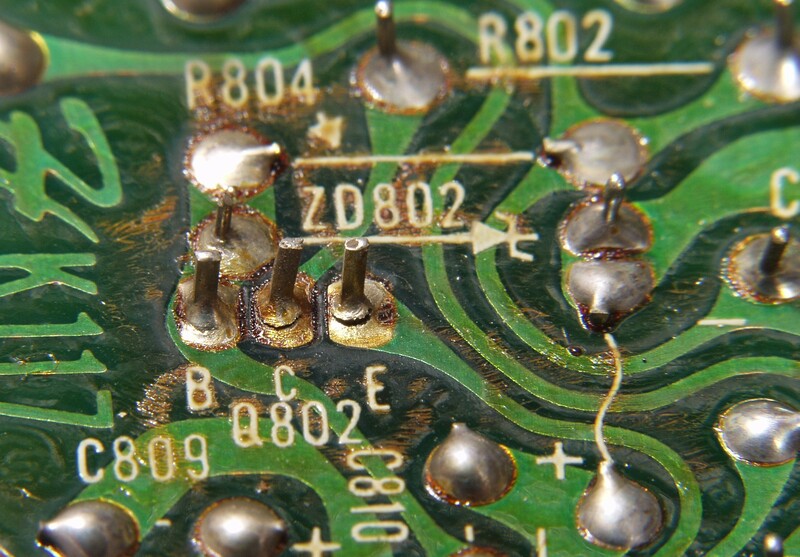 In some cases where there has been extreme heat sometimes the copper track can lift or break or the component leg becomes tarnished so the pin has to cleaned and/or the track repaired before new solder is applied. I usually check all boards inside an amplifier for dry joints regardless and touch up any that look suspect. Aging Capacitors – This is a big topic where vintage audio is concerned so I will cover the basics on capacitor aging and the way this can affect amplifier performance. Electrolytic Capacitors all have a specified value in micro farads (uf) generally ranging from 0.47uf all the way to 20,000uf and when the dielectric properties of the capacitor change as it ages the value begins to alter and causes the capacitors characteristics to change. This value can go up or down depending on the location of the capacitor in the circuit and how old it is. Another change within the capacitor is its ESR (Equivalent Series Resistance) ESR tends to increase with frequency due to effects of the electrolyte. It also increases over time with use and the ESR can increase enough to cause circuit malfunction although measured capacitance may remain within tolerance. While this happens with normal aging, high temperatures and large ripple current exacerbate the problem. In a circuit with significant ripple current, an increase in ESR will increase heat dissipation, thus accelerating aging. Capacitors which are exposed to a lot of heat over time or are in hard working parts of the circuit for example in a power supply will eventually fail causing the capacitance value to go drop almost nothing or go open circuit and in a worse case scenario – it can explode or cause other component damage. In an amplifier these changes can produce a number of symptoms. A leaky capacitor that has dropped significantly low in its value in the power supply section can cause hum and noise to be heard or the amplifier just won’t function properly due to the power supply rails being off balance due to the faulty capacitor pulling the voltage down or passing too much AC ripple. In the audio signal path this also can cause weak/flat sound, channel imbalance and loss of bass or treble or just general ‘muddiness’ across the whole sound spectrum. I have been finding with a lot of the older low value small electrolytic capacitors that their values have been going upwards and way beyond the manufacturing tolerance. For example a 10uf capacitor reading about 33uf or a 470uf reading close to 800uf! While the ESR reading is still within spec, the capacitance has altered and this can cause a change in the way a circuit behaves especially in the likes of tone control sections where there are filter networks and so forth which in turn can alter the sound from the amplifier. Some amplifiers can run for years with aged/tired capacitors and others will fail or let you know pretty quick that they are not happy. One sure way to keep the the unit going reliably and sounding good is to replace all these old capacitors. Re-capping is a normal part of restoring older amplifiers and it’s a well known practice with valve amplifiers/valve guitar amps and valve radios where there are high voltages and heat present. On the whole most of the capacitors I remove and test are generally off by some degree and at least 50% are way out. The older the capacitor is the more likely that it may need replacing. I use good quality Panasonic FC and Nichicon capacitors when I recap a unit and have had good results from using these manufacturer’s brand of caps.